So you’ve written a spectacular book and are ready to share it with the world. Rock on! DIY Publishing is all about taking the reins of your career and not waiting for permission to share your art. Hold on for just a moment though. As tempting as it is to hit that shiny Publish button, there’s two important things you need to consider first: Privacy and Branding. Everyone hopes to one day be a best selling author (at least, I think every author hopes for that…). But we all know fame comes with a price. And best selling author or not, when you publish a novel you become, to some degree, a public figure. Your name, your likeness, your work all exist to some extent beyond your control. So, it’s important to create a separation between public you and private you. Which is not to suggest you should be inauthentic in your blogging or social media or interactions with readers and fans. That authenticity is an important part of the next step – Branding. Privacy is all about business. Most people will probably tell you to set up an LLC and a few years ago, I would have been one of them. But the reality is, unless you’re making $100,000/year then an LLC is a bit of overkill. Especially when you can accomplish everything you need with a trademark. The red tape around a trademark is much simpler than an LLC (you don’t need Articles of Organization or any of the other extraneous documents) and less expensive (you don’t have to pay an annual fee, trademarks generally need to be renewed every 5 years or so). The bottom line, though, is whether you choose a trademark or an LLC, you’re better off with a separate entity for the business of publishing your work. It serves as your public front for contracts, taxes, financial interactions, etc. Having a trademark also lends your books credibility. 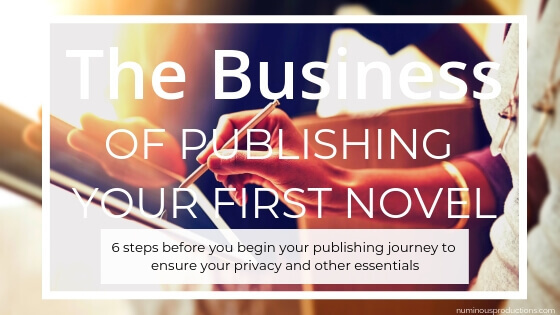 You’re basically creating your own publishing company for your work and having that company name – on your title page, on Goodreads, on ISBN information – is the professional stamp you need. A business email gives your company a level of professionalism (flashfan342@email.com is fine for your mom – not so much for your company). It creates a way for people to contact you apart from your personal email. And it focuses all your business correspondence separately from your personal email (because there’s A LOT of places you have to provide your email address). It’s best to have an email address that corresponds with your company name. After you’ve registered your trademark, get an EIN for tax purposes (in the US – I’m not sure what the equivalent is in other countries). The important thing here is that when you sell copies of you book, you have to pay taxes on those sales. If you don’t have an EIN, you’re going to have to give your social security number out all over the place. And particularly to companies that are already hoarding as much personal information about you as they can. An EIN allows you to report those sales for your taxes and protect your social security number. You can get one for free (and if you went the trademark route – you can get an EIN as a sole proprietor, you don’t need an LLC) and you can get one online. When you register a trademark (or an LLC) you’ll generally want a separate bank account for those finances. If anyone is ever going to write you a check, you’ll need a business account in that name to deposit it. If you’re primarily going to get direct deposits (from online sales) than you can skirt this a bit and have the money deposited in a non-business checking or savings account. Either way, a separate bank account reinforces that separation between your private finances and your business. It also provides an account to use for your business expenses apart from your personal expenses (to easily track tax deductions). It’s not that big of a deal if you sell a hundred copies of your books a year. But setting up an online bank account specifically for your writing income is also not that big of a deal. Or if you’d rather have a personal account than a business account, CapitalOne360 offers free personal checking and savings accounts. When you upload your manuscript you’re going to need to provide your address several times. Like when people request a review copy and you mail it with a return address. Or when readers want to send you something fun or you need to provide an address for different business transactions. You don’t want everyone to know where you live. Especially if you become a best selling author. Maybe it takes 2 years and maybe it takes 25 but if you’ve been cavalier about your address and then one of your books takes off and suddenly you have thousands of readers who all want to know more about you and you’ve been throwing your home address everywhere… you want to enjoy your writing, enjoy your popularity and still feel safe. Come up with your “author” autograph and make sure it’s different than your signature on legal documents, checks and credit card authorizations. Also, keep the answers to security questions for your accounts private. In fact, come up with easily remembered lies. It’s too easy to search for your mother’s maiden name, or your high school mascot. If the answer isn’t actually the truth it creates an additional layer of security. Though the reasons you might use a nom de plume have changed in the era of digital publishing now is a good time to consider it and decide which is best for you. If nothing else, it’s one more way to create a separation between your public life and your private life. Also, think about protecting your family when you consider what you’re posting online. Many authors avoid using the names of their spouses and children, don’t post pictures of their children online, avoid references to their hometown in twitter or instagram posts. It’s mostly basic internet safety, taken up one level with the expectation that one day, people will want to know as much as possible about you. Which is cool, hopefully one day. The road to that begins with Branding. And check out the entire DIY Publishing series! Like what you see? Subscribe via email and get updates on our latest projects.